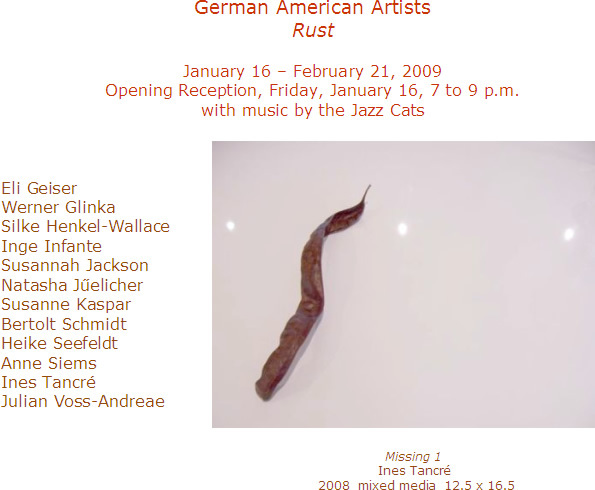 Rust, presented in the East Wing Gallery, is an exhibition by the group German American Artists, in which the artists address the character and power of rust on both physical and emotional levels. Some of these artists work with rust literally, gaining inspiration from rusty nails that drip patterns onto walls, from heaps of corroding material at the recycling center, and from cars being eaten into oblivion by rust. Other works are more metaphorical and evocative of the passage of time, the fading of memories, and life’s journey toward nothingness. In this exhibit, the participating artists, each in their individual style, reflect their feelings about rust, the potent and beautiful destroyer. 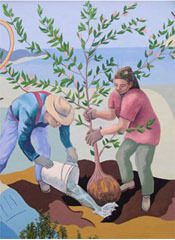 German American Artists is a group of German visual artists founded in 2005 by Werner Glinka, Inge Infante, and Ines Tancré to promote the work of artists with a strong affinity to German culture. The group is located in the San Francisco Bay Area but also has members in Oregon and Washington and a representative in Europe. Twelve members of the group are participating in Rust.